The Howard Hughes Corporation® (NYSE: HHC) and its wholly-owned subsidiary, The Woodlands Development Company, announced today that it has begun construction on a 205-key Embassy Suites Hotel at Hughes Landing®, a 66-acre mixed-use development in The Woodlands®, the country’s premier master planned community. Located on Lake Woodlands, Hughes Landing is a vibrant waterfront destination where people will live, work and play in a walkable community with a blend of popular retailers, dining, entertainment, multifamily residences and Class A office space. The new 205-room Embassy Suites is an upscale, all-suite, full-service hotel for both business and leisure travelers, slated for completion in late 2015. 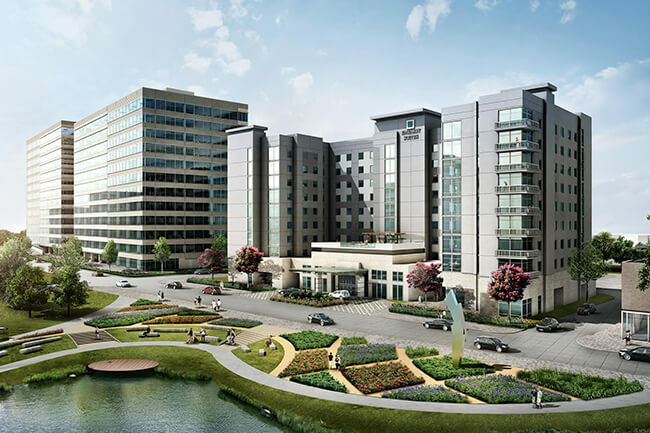 The 172,000-square-foot hotel will feature 3,000 square feet of meeting and event space; Embassy BusinessLink™ Business Center; a full-service bar and restaurant; and a 4,000-square-foot rooftop pool deck that overlooks Lake Woodlands. A 24-hour fitness center will include state-of-the-art cardio, balance equipment and weight-training options. and an evening manager’s reception that offers complimentary snacks and drinks. The nine-story hotel is located in the heart of Hughes Landing within walking distance to the shopping, dining, entertainment and office components. Hughes Landing will also include Whole Foods Market®, Pier 1 Imports®, Escalante’s Fine Tex-Mex and Tequila, Local Pour gastropub, Del Frisco’s Grille and California Pizza Kitchen. The first multifamily development in Hughes Landing, One Lake’s Edge, will feature 390 luxury residences and is expected to open in early 2015. One Hughes Landing, a 197,719-square-foot, eight-story, Class A office building, opened September 2013, less than ten months after construction began and is now 100% occupied. Two Hughes Landing, a 197,714-square-foot, eight-story, Class A office building, opened in May and is 83% leased. The 12-story, approximately 321,000-square-foot Class A office building, Three Hughes Landing, recently broke ground with completion expected in the third quarter of 2015. All three buildings are designed to be LEED Silver Certified.